On Friday 28 September Palu and Donggala on the island of Sulawesi, Indonesia, suffered a 7.5 magnitude earthquake, which then triggered a tsunami, with waves reportedly reaching as high as six metres. 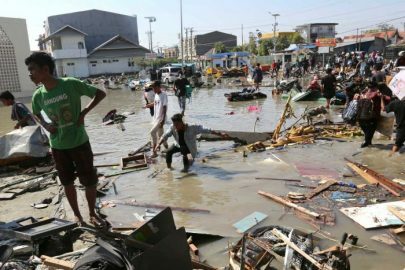 The death toll from this disaster reached more than 2,200, with many people still missing due to liquefaction of the soil and size of the waves. Along with the people who were killed and injured by the earthquake and tsunami, more than 2.4 million people have been impacted by the disaster; displaced from their homes, seeking refuge in shelters, and trying to access clean water and supplies. Aftershocks of up to 5.5 magnitude left people in fear and sleeping outside. Electricity and communications are cut off. There is widespread devastation. Anglican Overseas Aid has launched an appeal to help the people of Donggala and Palu in aid and recovery efforts through our membership of the global ACT Alliance. The disaster has put the area in a state of crisis. The people affected find themselves in a desperate situation, with immediate needs of food, safe shelter, basic health services and drinking water, and sanitation. This is particularly the case for the elderly, children, pregnant women, and those living with a disability. Anglican Overseas Aid is already responding by sending $10,000 from our Rapid Response Emergency Fund to help. Our partners through ACT Alliance, Peleski and YEU, we have been and are currently helping to evacuate people, provide health services, food and supplies, as well as help resettle those impacted. Your donations will help bring immediate relief to the people suffering from this disaster, providing health services, food and clean water, items like blankets and tarpaulins to make sure that people’s needs are met. It will also help in the long term through working with the communities to rebuild and set up livelihoods once again. For an update on the appeal (as of our January 2019 Summer Abundance) click here. To donate to our Indonesia Tsunami Appeal, click on the ‘Please Donate’ button below (‘Indonesia Tsunami Appeal’ in the drop-down menu) or call us on 1800 249 880. The Australian Council for International Development (ACFID), of which we are a member, and whose Code of Conduct we are a signatory to, has advised how the Australian public can support the relief effort.